Meade and Theodore Lyman both wrote home on September 11 and I include both letters. All was quiet on the eastern theater’s front. Regarding the cigars Meade received, Ulysses S. Grant, too, also began receiving shipments of cigars from admirers following his victories in the west and his attempt to smoke as many of them as possible quite likely led to the cancer that killed him. Everything remains quiet and in status quo. Humphreys has gone to Philadelphia for a few days to see his wife, who is in the country, and will call to see you, and give you the latest news from camp. I wrote you in my last, of being the recipient of a bouquet from Wisconsin; but since then I have been honored with two very valuable presents. The first is a handsome scarf pin of gold and enamel. It is accompanied with a very flattering note stating it was made in England, and brought over by the donor to be presented in the name of himself and wife, as a tribute of admiration for my great services in saving the country. The note is signed W. H. Schenley, and I think the writer is a Captain Schenley, of the British navy, who many years since married Miss Croghan, of Pittsburgh. Captain Schenley says he intends visiting the army and making my acquaintance. The second present is five hundred most delicious Havana cigars, sent to me by a Mr. Motley, of New York, whom I accidentally met at the sword presentation to General Sedgwick, and to whom I must have been particularly civil, or in some way made a great impression on him, to induce him to send me five hundred cigars. So you see there is some compensation for the misery we have to suffer. The last two days have been most unusually quiet. I read a little in military books, write a few letters, look over the newspapers a little, talk to the Staff officers, and go to bed early. The conversation of the officers is extremely entertaining, as most of them have been in a good many battles. They say that General Meade is an extremely cool man. At Gettysburg he was in a little wooden house, when the hot fire began. The shells flew very thick and close, and his Staff, who were outside, got under the lee of the house and sat down on the grass. As they sat there, out came General Meade, who, seeing them under such a slender protection against cannon-balls, began to laugh, and said: “That now reminds me of a feller at the Battle of Buena Vista, who, having got behind a wagon, during a severe cannonade, was there found by General Taylor. ‘Wall Gin’ral,’ said he, looking rather sheepish, ‘this ain’t much protection, but it kinder feels as it was. '” As a point to the Chief’s anecdote, a spherical case came through the house at that instant, exploded in their circle and wounded Colonel Dickinson. . . . 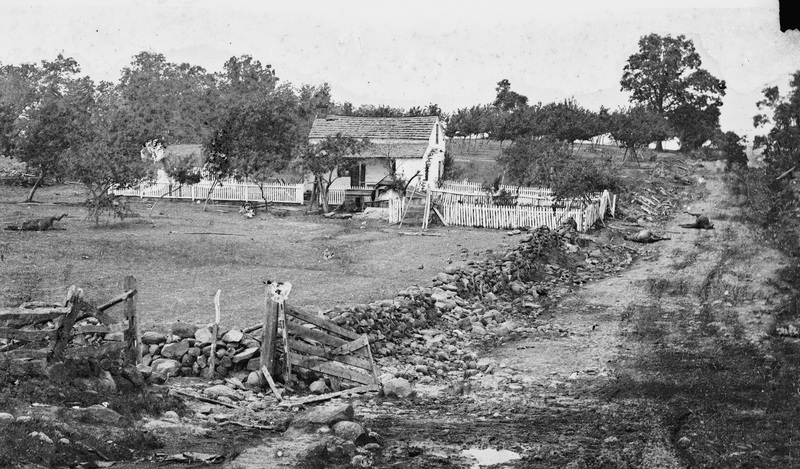 The Lydia Leister house at Gettysburg, which Meade used as his headquarters during the battle. Notice the dead horses in the road. Lyman relates a story about Meade here on July 3, 1863 (Library of Congress). I walked over and saw the Provost prisoners, the other evening. If you want to see degraded human nature, there was the chance. There was a bough covering, about forty feet square, guarded by sentries, and under it were grouped some fifty of the most miserable and depraved human beings I ever saw—deserters, stray Rebel soldiers, “bushwhackers” and camp-followers. They sleep on the bare ground with such covering as they may have, and get a ration of pork and biscuit every day. This is only a sort of temporary guardhouse, where they are put as they come in. War is a hard thing. This country, just here, was once all fenced in and planted; now there isn’t a rail left and the land is either covered with dried weeds or is turned into a dusty plain by the innumerable trains of horses, mules and waggons. Meade’s correspondence taken from The Life and Letters of George Gordon Meade, Major-General United States Army, Vol. 2, (New York: Charles Scribner’s Sons, 1913), pp. 147-8. Available via Google Books. Theodore Lyman’s letter is from Meade’s Headquarters, 1863-1865: Letters of Colonel Theodore Lyman from the Wilderness to Appomattox, pp. 12-13.Edited by George R. Agassiz. Boston, Massachusetts Historical Society, 1922. Available via Google Books.